76 pages chock full of money learning fun. Step by step interactive learning that will teach your child 8 core money skills. Discerning between needs and wants, set short and long term financial goals, earn money, save money, track money, spend wisely, spend less than is earned, and be charitable. Bright, durable, fun pouches that serve as �envelopes� for storing money as kids save for their goals. Time to graduate from the piggy bank and use a pouch for each goal. Unlike using a piggy bank, the pouches teach kids about money goals. A mass of silicone created with artificial color and poured into a mold. Dude, it�s a reminder band to help you think before you buy. 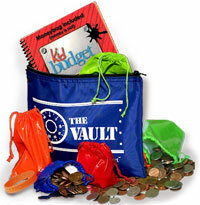 Their very own vault to have a place for all of their pouches, money, trackers, and workbook. No more wondering where the money got put. It�s all in ONE place. 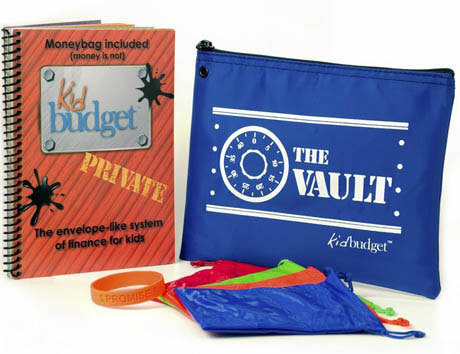 The Kidbudget money system is adaptable to your family�s money values. The system is designed to teach kids about money by using the 8 core money skills plus: what is money, where does money come from, why it�s important to manage, as well as a bunch of fun facts about money. But the �nuts and bolts� are up to you. You decide with your child how much money goes to each goal. You decide on the rules for when they can spend their money. You decide if they get paid for chores, get an allowance or need to put aside a certain amount of money in a savings account. This is why principle based learning is so powerful.